Much awaited "Office for iPad" has arrived now. Microsoft has finally launched it on iOS platform. CEO of Microsoft, Satya Nadella has encouraged the effort to be neutralized, which made MS office files run on iPads. 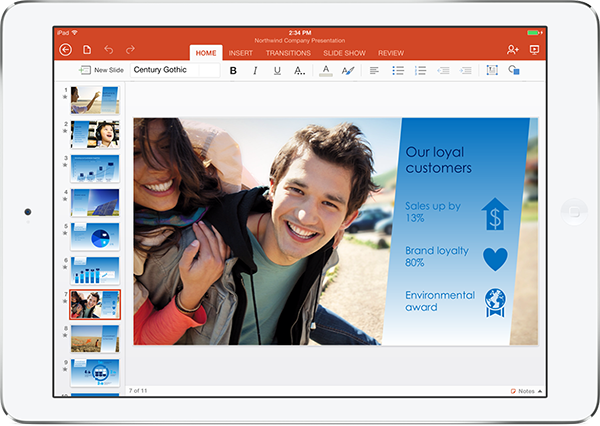 Microsoft has “reimagined” Office for iPad, “while retaining what people love about Office. We hope you’ll be as pleased with the results as we are,” as stated in a blog post. Company also added that Microsoft Word, Excel and Powerpoint “have the robust capabilities and familiar look and feel that is unmistakably Office, while offering a fantastic touch experience built from the ground up for iPad." The free apps offer users the documents they want. Microsoft has also committed to provide the look just as good on iPad as they do on PC. Microsoft is also bringing Office apps to the Windows Store and other popular platforms and has made Office Mobile for iPhone and Android phones available for free. If you are an iPad user, you can download Word, Excel and PowerPoint from the App Store.